Throughout all of this, I discovered more family than I realized I had! My husband, George, is now deceased (Oct., 2008), but we were lucky to have been able to take part in the Schwindt Reunion in the summer of 2007. I composed the Schwindt History and Recipe Book with his help, and, of course, all of the "Schwindt offspring". George and I were both previously married, so our family consists of your's, mine, and our's, and it keeps growing and growing. As a person "ages", it's hard to keep up with names and faces of the constant "additions" to the family. 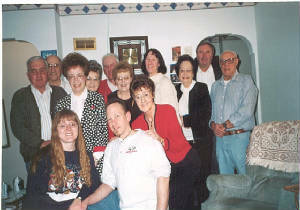 This photo was taken at my house in 1997...and I'll attempt to display the many "additions" to all of our children.